We have just subscribed to intervals and I am just having a bit of trouble getting my head around the relationship between projects, modules, tasks and how these interact with each other. I work in a design/advertising agency and we have Clients, each of these clients have multiple jobs (active and insctive), each of these jobs have a series of steps that need to happen from briefing to a completion and each one of these steps need to be completed by a different team members. Modules - These are the steps involved in completing the task e.g. Brief from client, manager to brief designer, artwork to client etc. If there are any links to previous posts that describe the hierarchy of projects, modules and tasks, and how they interact, it would be a great help. This discussion on modules might be worth a look. In the designing a logo example above I recommend doing that as a task with a more broadly defined project. A task has a comment history, documents and versions can be attached to the task, and the task has a workflow life cycle from start to completion. We typically setup each contract as a project. Since we do web development we typically have a web design or web maintenance contract and we knock out all of the requests and work as tasks. Modules are a management tool to group tasks and time into buckets. 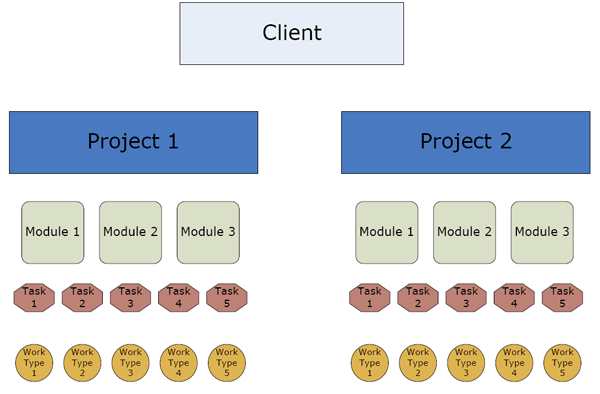 The most common use of modules is for phases or projects or for features that are being developed. To use the phase example say you have a discovery phase for a particular project. The discovery module can be used to organize all of the tasks and time for that phase of the project. Then you can run reports on that particular phase of the project. Also you can compare the discovery phase for that project to other similar projects to perform time analysis. If it would help to dialogue directly with our support team please feel free to shoot an email to support@myintervals.com and we will do our best to get back to you promptly.